This is how we apply Charlotte Mason methodology in our homeschool. Hopefully some of these suggestions will give you food for thought and may spur you on to read Charlotte Mason's own writings, explaining the richness of her comprehensive, thorough living education. Charlotte Mason insisted that children are read excellent literature. "For this reason we owe it to every child to put them in communication with great minds that he may get at great thoughts; with the minds, that is, of those who have left us great works; and the only vital method of education appears to be that children should read worthy books, many worthy books." Charlotte Mason, A Philosophy of Education, 1925. I must note here that Charlotte Mason says reading to children should "be only an occasional treat and indulgence, allowed before bedtime, for example." In her first volume, she goes on to say, "We must remember the natural inertness of a chid's mind; give him the habit of being read to, and he will steadily shirk the labour of reading for himself; indeed, we all like to be spoon-fed with our intellectual meat, or we should read and think more for ourselves and be less eager to run after lectures." 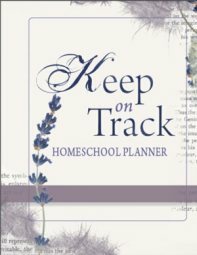 Volume One: Home Education, by Charlotte M.Mason p228. Therefore, a Charlotte Mason education consists of putting children in communication with great minds which when able, they will read for themselves. However, in order to whet the child's appetite for excellent literature and encourage the love of literature, I would still recommend treating your children with the wonderful experience of reading aloud to them. Every day, I read aloud to my children (all ages) from morning tea to lunch. 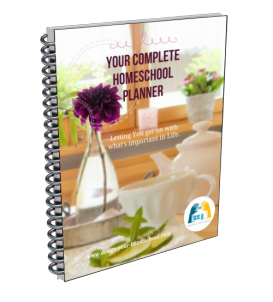 It has become an ingrained part of our day, and when I have tried to play around with the schedule, that is one part that none of the children ever let me move or miss out on. 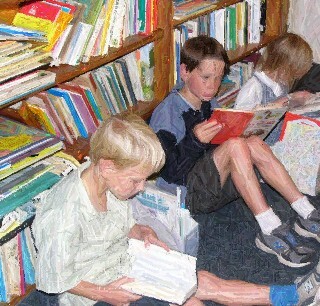 Reading aloud is the best memory of homeschooling that my children have. Some prefer to cuddle next to me and others like to draw, or colour, or play quietly with a game. I don’t need to worry whether they are listening, because the stories are so great, they don’t want to miss out and rob themselves of the pleasure. I have two times in my day in which I read aloud. After morning tea, the older children read to themselves, and I have a special time to read books at the level appropriate to the younger ones. At this time, I choose literature, history, Science readings or poetry. After that I read books at the age level of the oldest, and the young ones pick up enough to follow the story. I usually read an historical fiction novel at this time or a literature novel. From time to time, they are also spoilt at night when Dad reads a family book. Recently, we've been reading the "Little Britches" series. Living books are not dry textbooks. They are filled with life and ideas that touch the heart and mind. They awaken curiosity; they do not dull our senses. Living books crosses the curriculum areas: fictional stories, non-fiction (interesting, colourful science books, dealing with important details, not dumbed-down), or history books which make the subject come alive – the person, the issues, the places and things, sparking imagination and curiosity. Another quote from Charlotte Mason: "..we must sustain a child’s inner life with ideas as we sustain his body with food." Towards a Philosophy of Education. Narration is simply the child "telling back" what they have listened to. This crosses all subject areas also. Charlotte Mason says "Robinson Crusoe, Pilgrim's Progress, Tanglewood Tales and much of the same calibre will occupy him until he is eight. The points to be borne in mind are, that he should have no book which is not a child's classic; and that given the right book, it must not be diluted with talk or broken up with questions, but given to the boy in fit portions as wholesome meat for his mind, in the full trust that a child's mind is able to deal with its proper food." From a very early age, a child can tell the Bible story you have read. Through the years, each of my children have compiled their own Old and New Testament Bible Story book. They are filled with their own narrations. I have copied down their words and when they were ready, they began to write their own narrations. We have used narration in Science, Literature, Bible and especially History. Aesop’s Fables are great to narrate because they are interesting in detail and yet not too long. The beauty with narration is that you are setting the scene for writing compositions. As they re-tell a story, they place events in an ordered sequence, they search for the best vocabulary, they repeat correct sentence structure, all with their minds. As they develop in their writing skills, they can take over the job of writing the narrations. Children will make the transition slowly and at different ages. I usually begin this by getting them to copy underneath my words (which they have narrated to me) and then slowly, putting the job more and more into their hands. Charlotte Mason stressed forming good habits of attention and concentration. The way she encouraged this was by having short lessons. If our children are dawdling through a lesson, we are actually teaching them in-attention. We can create the habit of a wandering mind, if our child is in a chaotic, confusing environment or if they are wearied for hours with boring material. I have made it my aim not to set meaningless, time-wasting tasks. If I have asked my children to do some written work, I expect a high standard (not always reached! ), so that we do not waste time and also so that we can look back on what we have done and enjoy it. No-one looks back at a fill-in-the-blank workbook. The meaningful work we have done, when we have interacted with the real world around us, and made some record of it, this is what we like to keep and enjoy again. For a subject such as Maths, I would (at times) set my kitchen timer for 15 minutes (or less) and then ask the child to really set his mind to the task until the timer went off. This is a way to encourage good use of time. I have scheduled my child’s morning in this manner to teach them a good use of time. Through this, they have learned to work diligently and productively for that required amount of time. Copybook is a very effortless way of teaching a number of things. It is an easy way to teach correct punctuation. The child needs to copy exactly what you have written or what is in a given text and so they need to copy the capital letters and the fullstops. As the difficulty of the passage increases, there are other aspects of punctuation to be taught in the context of real writing- commas, quotation marks, semi-colons, colons and so on.Another benefit of simple copying is that children are seeing words written correctly, and are copying them in correct spelling. They may not be reading fluently, yet their eyes are constantly observing how letter patterns are formed, and also subconsciously realizing that there are no patterns of d followed by b, or t followed by f and so on. The beauty of copying is that you do not need anything apart from what you are already using. Copying is an extension of whatever the child is listening to. Copywork should come from the most excellent literature, and therefore, the Bible is an excellent source. My children have always had a small Bible Copybook in which they copy the Bible verses which they are memorizing. Apart from our Bible Copybook, we have a Writing Treasure which is a blank notebook (Art book) into which they copy poetry and excerpts from literature. I either rule lines, or glue in lined papers for their writings and leave space for their drawings. Through the years, I have selected poems, which I would like all of my children to have in their Writing Treasures, and organized them year by year. Sometimes, we all add the same poem, but mostly the children are working on their own poems. The Literature they include in their Writing Treasures are from the books we are reading. It may be an historical fiction novel, a biography or another excellent source of literature. We copy Aesop’s fables from time to time also. Charlotte Mason would advise us to take our children outdoors every day. Our aim is to have a nature walk every week and I find that hard to achieve. However, I still want to mention this as a goal of mine. This is another of her ideas which instills a love of nature, an appreciation of the world, direct observation and recording and develop a scientific interest. She encourages children and adults to keep a Nature Journal.We take our journals when we walk and draw whatever interests us. We add a date, some details(of the weather, temp, location etc) and we sometimes spend time at home finding it’s scientific name. It is very rewarding. Charlotte Mason inspires us to pass on a rich culture of ideas in every subject area. 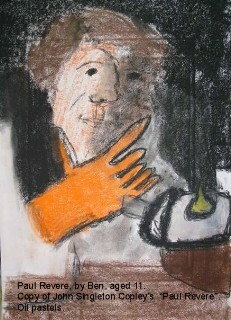 In art, she encourages us to spend some time absorbing the great artists by viewing their work. After the child has viewed the picture for a little while, they are asked to re-tell all that they remember or to draw what it was like without looking. As they do this more and more, they are becoming keen observers of detail and the paintings are becoming their friends. Since we learn history chronologically, we deal with the artists as we reach their time in history. Then we read of their life, view their art and copy it. Similarly, we read about the life of composers and listen to their music as we move through history chronologically. Would you like to see how you can make it work for your family? Design your own Charlotte Mason Approach.